INDIANAPOLIS— State lawmakers have filed two bills aimed at testing your child’s classroom for radon, a cancer-causing gas you can’t see or smell. Rep. Carey Hamilton, D-Indianapolis, and Sen. Eddie Melton, D-Gary, filed separate pieces of legislation in response to a Call 6 Investigation that found 96 percent of public schools in Indiana have not tested for radon in the last decade, despite EPA guidance that recommends schools test at least every five years. RELATED | CALL 6: Most Indiana schools ignore federal radon testing recommendations because it's not required. Radon comes from decaying uranium in the soil and can seep into cracks in foundations and into your child’s classroom. Even though Indiana is in a radon “hot zone,” most students, parents, teachers and school leaders have no idea if they’re being exposed to the number one cause of lung cancer among non-smokers. 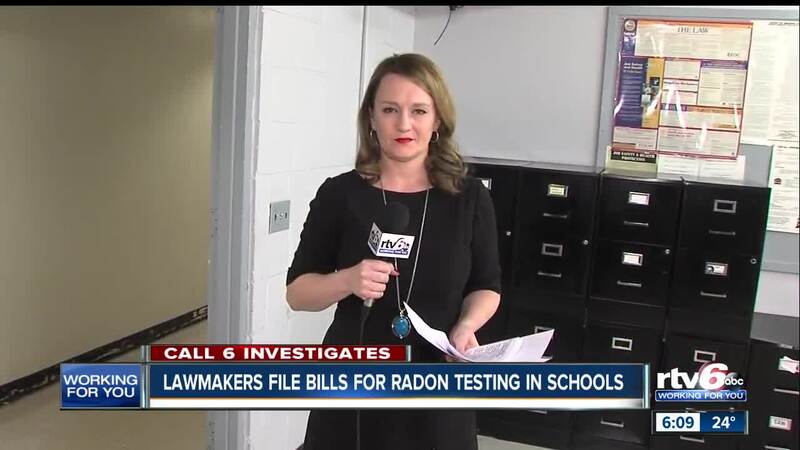 Melton’s bill, Senate Bill 522, would require public and nonpublic schools to test for radon by July 2020 and at least once every five years after that. "I don't think it's a hard sell when you're talking about the safety of children," Melton told Call 6 Investigates. The tests would have to be done by someone certified in radon testing. Melton’s bill would also require licensed child care centers and child care ministries to be tested for radon gas by July 1, 2020. The legislation leaves it up to the school superintendent and the Indiana State Department of Health to determine which buildings to test, which rooms to test, the method of testing, as well as who will be notified of the test results. All school radon test results would be submitted to the Indiana State Department of Health who would compile the statewide data. Melton’s bill also recognizes schools who may have already tested, and says if a school building was tested between June 2014 and July 2019, the next text must be performed within five years of the latest test. Hamilton also filed legislation, House Bill 1292, that would require the Indiana State Department of Health to establish a program for testing and reducing radon gas in school buildings. Hamilton’s bill also pushes for Indiana to apply for federal funding through the EPA’s indoor radon grant program, which would help cover the cost of testing schools. If the legislature agrees with either bill, your child’s classroom could soon be tested for radon. Most people don’t know radon damaged their lungs until they develop problems as an adult. Lawmakers say radon tests could protect your child’s lungs and give them a healthier life. Both radon bills will now be assigned to committees, and those committees are expected to discuss how to pay for radon tests. Call 6 Investigates found a dozen other states have already taken action regarding radon in schools — implementing laws or regulations that require or recommend testing. New Jersey requires new schools use radon-resistant materials and techniques. In Florida, schools test for radon and report their results to the state department of health. Illinois has an education law that recommends schools test for radon. Indiana currently has nothing in place regarding radon in the classroom.